Well this has been very slow going but I finally have an update. The finished piece is done from a photo that I took at a wildlife sanctuary where I am a docent. The name of the sanctuary is Performing Animal Welfare Society (PAWS). 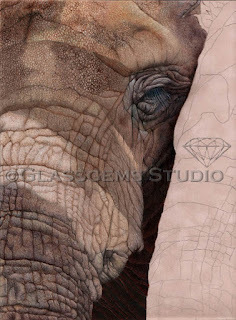 The reference photo is of two elephants that are always together and their names are Mara and Maggie. I have one of the elephants done so far. One thing I have to say is..... Elephant skin is sooooo boring!!!!! LOL! That probably has a lot to do with why this is taking such a long time. If you have any question or comments don't hesitate to speak up.